Had an awesome day on Saturday! The Car Wash was a great program success with contributions from everyone! I especially want to thank the parents who gave of their time and materials! It was great to have tunes, supplies and all the help! 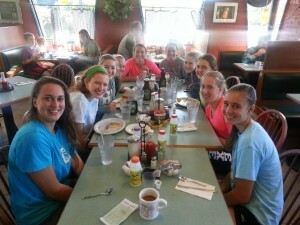 Had a great practice with Varsity Saturday morning followed by Breakfast (photo left) at Steve’s Diner! Then off to the car wash for the 12-2 shift! It was a lot of fun! All three teams, one bus. Be prepared! Recap – Refire Dig Pink Week!